Hatching a company and incubating it to growth does not entirely depend on a facility but, starting in an environment of like minded people, having access to resources and availability of expertise, only helps move your company to success. 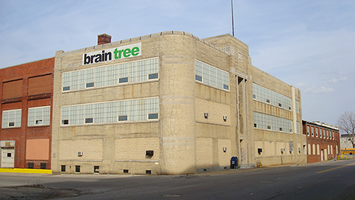 Braintree as part of its incubation program, Braintree's main building is an 80,000 square foot facility in downtown Mansfield. Two shared conference rooms and an informal meeting area allow tenants to conduct training classes, present to potential vendors/clients and conduct business which may require larger spaces. Braintree offers building wide internet access and utilities are included in many spaces. Shared use copiers and fax machines minimize the initial expenditures an entrepreneur needs to invest in. Braintree provides common warehouse services such as material handling, truck dockage, common carrier, and basic janitorial & maintenance services. A collaborative atmosphere of shared experiences allows an entrepreneurs to grow through interaction with others who "have been there and done that". Braintree's objective is to assist its clients in maintaining low overhead expenses during their start-up expansion phases.